As I have told my friends on Twitter, my first position got stopped out when the pair briefly dipped below the .9800 major psychological handle. Boo! Around that time though, my second entry order at .9800 got triggered and the pair slowly crawled upwards this week. Unfortunately for my trade, Canada’s Ivey PMI just came in much stronger than expected and higher than the previous figure. 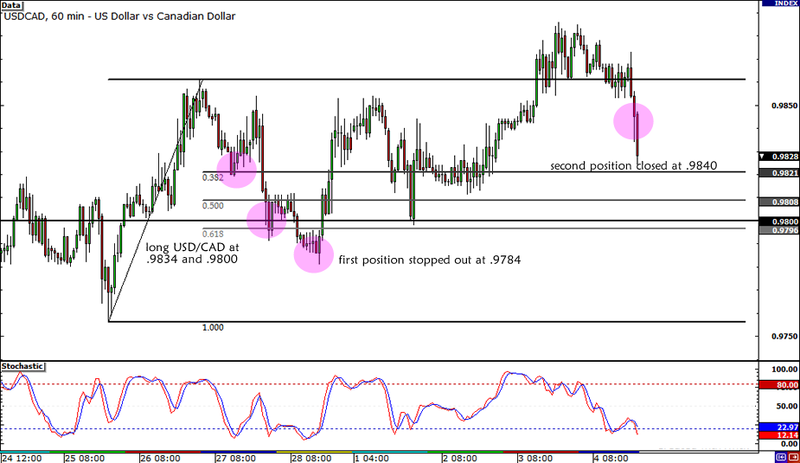 This was enough to push USD/CAD below the .9850 handle. I figured that the selloff would continue for the rest of the U.S. session so I just decided to close my trade manually. Overall, I wasn’t able to end up with a win on this trade as I had hoped. So much for closing out Q3 2012 with a win! But now that I have all the numbers for all my trades in Q3, stay tuned for my Q3 trading results coming up tomorrow! In case you haven’t seen it yet, I have also published my breakdown of the major market themes and comdoll price action for the months of July, August, and September. Check it out! I’m in… again! Well, my second position is, anyway. As we had predicted, the Spanish government’s austerity plans was the wildcard event for this week as it gave clues on whether or not Spain will eventually ask for a bailout. Thanks to Spain’s highly optimistic plans and speculations of Chinese stimulus during the early Asian session, USD/CAD dropped to the .9800 area where I placed my original entry orders. I’m keeping my trades open for now, but I’m planning to move my stop loss to break even as soon as USD/CAD breaks above the all-important .9850 handle. What do you think? 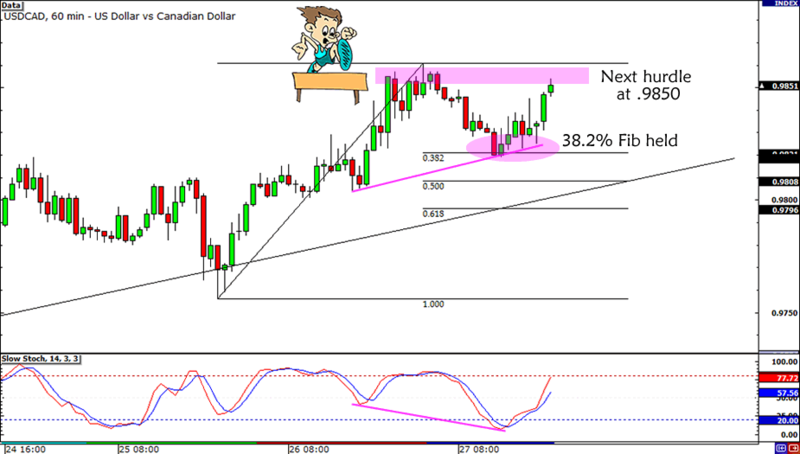 Should I wait for USD/CAD to turn back up, or should I call it a day and close my positions? Your thoughts are much appreciated! It looks like risk is still off in the markets today as the 38.2% Fib seems to be holding for USD/CAD… and that’s why I decided to enter half of my position at market! 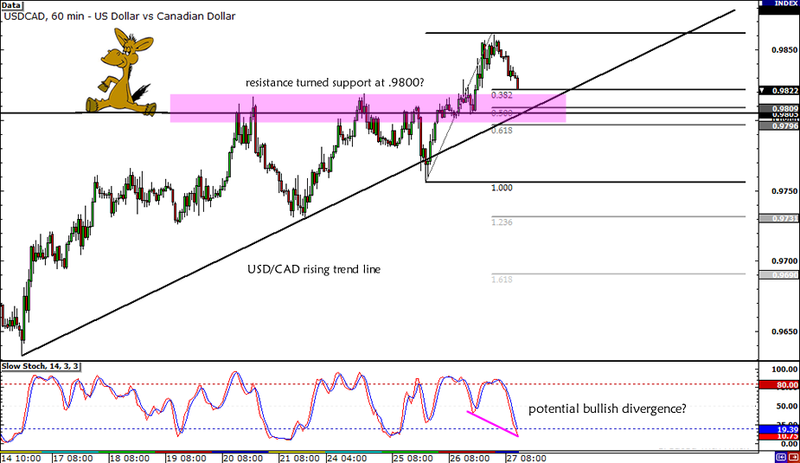 As I was watching the 1-hour chart earlier during the start of the London session, USD/CAD seemed to be finding support at the topmost Fib while Stochastic was crossing upwards from the oversold region. I didn’t want to miss out on the chance to jump in a long trade in case the pair doesn’t dip as low as my .9800 entry price. So far, I’m not regretting my decision to enter early since my first position is currently in the green. As I mentioned on Twitter, I was able to go long at .9834 with a 50-pip stop below the .9800 major psychological level. Since I was planning on risking at most 0.5% of my account on this trade, I risked half at market and left my original entry order at .9800 with 0.25% risk. Do you think I made a good decision or was I being too rash? I’d really appreciate your feedback on this one! It’s my last trade for the quarter, folks! Although Q3 hasn’t been too kind to my trades, I’m feeling optimistic that this trade is my lucky one before I say au revoir to the trading quarter. As I mentioned in my Midweek Market Analysis this week, protests in Spain and uncertainties in the euro zone are keeping the lid on the high-yielding currencies’ rally against the dollar. Heck, traders even ignored a strong retail sales data from Canada! I believe that unless Spain‘s Mariano Rajoy blows our expectations out of the water with his austerity plans, we’ll continue to see weaknesses in high-yielding currencies like the Loonie. On the technical side, I have my eyes locked on USD/CAD’s .9800 major psychological handle. Aside from being a former resistance level, it’s also a good spot for a retest of a broken trend line on the higher time frames. But what sealed the deal for me is a possible bounce at the Fib on the 1-hour chart, which is supported by a potential bullish divergence. Buy at .9800 with a stop loss at .9750 (below the rising trend line on the 1hr chart). I’ll move my stop to BE once price reaches .9850 and start looking for a profit target from there. Be sure to read our risk disclosure if you’re planning to trade with me! I gotta be careful though, as I heard from my forex friends that speculations on a possible Chinese government stimulus is propping up risk sentiment as well as oil prices. I hope for the sake of my trade that this is only a retracement! 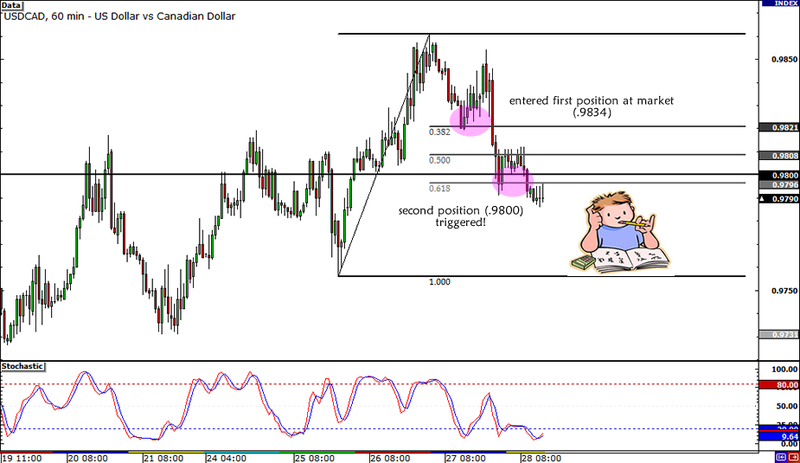 In any case, I’ll be watching USD/CAD’s price action closely and see how I can manage my trade better. What do you think? Is this something that you’d want to trade? Don’t hesitate to give me a shout out! Journal trades with me on MeetPips.com! Have fun and good luck trading this week!